This series of videos, produced in collaboration with NOAA and the FAA, provides an introduction to the new Impacts TAF Board tactical decision aid. The new Aviation Weather Center (AWC) Impacts TAF Board helps aviation professionals easily monitor when and where airport operations will be impacted by the weather. This video introduces the history, purpose and benefits of the board. 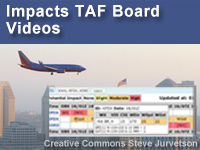 This video explores the Impacts TAF Board website and explains the key elements of the board and how to use them. Special thanks to Brandon Smith and Joey Carr, who captured on-site video and photographs, and provided great insight into the tool's function and usage.